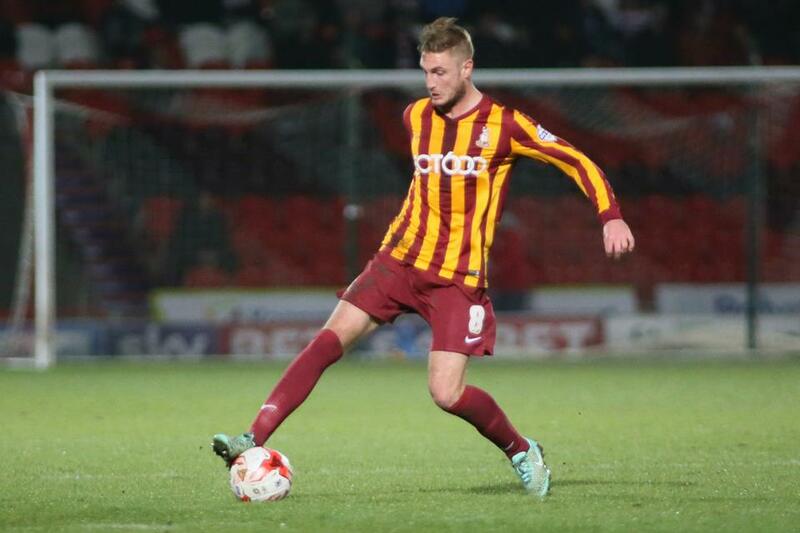 Bradford City host Bristol City on Tuesday with the Bantams’ ever-decreasing play off hopes hanging by a thread. This is probably City’s last throw of the dice in the search of a top six finish. Saturday’s defeat at Gillingham was a bitter pill to swallow. Despite a dominant performance, City failed to put their chances away, and paid the price for it. A regular failure to take chances has undoubtedly cost them a play off place this season. In games such as Fleetwood Town, Notts County, Walsall and Port Vale, City have dominated the majority of the 90 minutes, yet failed to win. This must be addressed if they are to mount a serious promotion push next year. With City’s play off ambitions looking increasingly unlikely, Phil Parkinson must surely be having one eye on planning for next season. With several players out of contract at the end of this season, the last four games of this season could be make-or-break for their futures at the club. The likes of Andrew Davies, Mark Yeates, and Christopher Routis all see their contracts expire in the summer, so these last few games are an opportunity to show what they can bring to the team. The Davies situation is probably the most contentious and debatable. Davies’ commitment is unquestionable, and his leadership, bravery and determination are outstanding. In terms of ability, he has been found out for pace on a couple of occasions this season, and has maybe not hit the heights of previous campaigns, but most of the time it is evident that he is a quality defender. His importance to the team is evident, with City winning 53% of the games that Davies has featured in this season. However, Davies’ injury problems are persistent. Davies has missed 23 games this season (he has played 30), and such a high rate of absence puts a question mark over his value to the squad. Davies is one of City’s highest earners, and therefore a contract extension could be a gamble. Prior to answering that big question, Parkinson’s attention turns to Tuesday night and the visit of Bristol City. The Robins can seal promotion with a win at Valley Parade, and look certain to go up as league champions. Under the leadership of Steve Cotterill, the visitors have had a fantastic season, losing just five games during the campaign. With a relatively small squad, Cotterill has opted to go for quality over quantity, and the performances of players such as Kieran Agard, Aden Flint and Luke Freeman have given them the edge over many sides this season. Last weekend saw them draw 1-1 at home to second-placed Preston North End, a result which sees the gap between the two remain at eight points. In a squad full of quality, the two players that stand out are Agard and Flint. Agard possesses blistering pace, and has a decent scoring record at this level. He found the net 26 times in 55 appearances last season (including two in Rotherham’s 3-0 FA Cup win over City), and has scored 11 league goals this year. The combination of Agard and former City loanee Aaron Wilbraham are a fantastic pairing, with Wilbraham’s size and aerial prowess a perfect foil for the pace and trickery of Agard. Both will have to be managed well if City are to get anything from Tuesday night’s game. At the other end of the pitch, Flint has been a rock at the heart of defence. The giant 25 year-old has been very impressive all season – netting twice against the Bantams last October – with his consistency rewarded with the League One Player of the Month trophy for March. Flint’s height and strength means he rarely loses out during physical battles, and he is one of the reasons why Bristol City’s defence is one of the tightest in the division. Should Steve Cotterill keep the same side that drew with Preston at the weekend, Bristol City will line up in a 3-5-2 formation, with Frank Fielding in goal and a back three of Luke Ayling, the ever-reliable Flint and Derrick Williams in front of him. In midfield, James Tavernier and Joe Bryan will occupy the flanks, with a central three of Marlon Pack, Korey Smith and Luke Freeman. Up front will be Agard and Wilbraham, a combination that can cause trouble for any side in this division. This could be a memorable night for Bristol City, but The Bantams could yet spoil the party and, in doing so, revive play off hopes that are hanging by a thread. Our performance at Ashton Gate must rank fairly high in this campaign, Bristol played a back three that night and we used the space well and we certainly deserved a draw, although Steve Cotterill’s post match comments gave us no credit. He has gathered a very good squad but money is no object down there, with an owner who came in and wrote off a £30m debt, finances a bullish playing budget and is redeveloping the ground. Interesting comments on contract situations and difficult decisions for PP, the need for a “20” goal man has been repeated often enough, but for me an injection of pace is another requirement. Interesting to note that Kieran Agard, who is rightly singled out by Andrew here, has also scored 11 goals this season. Clarke (11), Hanson (11), and Stead (10) are all in that same ballpark, suggesting perhaps that our lack of goals is to be found elsewhere on the park. We have a GD of +4 (GF 51), compared to Bristol’s dramatically superior GD of +44 (GF 80), so we have scored 29 fewer than them this season. As such I’m aware of the benefits of a “20 goal man”, but as Trevor rightly notes above, there are other areas of the team that we might want to focus upon in the summer in order to spread the scoring more widely AND to get even more out of the above front three. Pace is one, better service (especially from set pieces) is another. “20 goal” strikers ain’t cheap, after all, and McLean as this season’s big-money-investment in that area of the park let us down badly on so many fronts. I believe we have the foundation of an exceptionally good squad, which has been undone in 2014/15 by some very fine margins indeed. We could/should be at least 11-points better off but for those tiny lapses in concentration at the end of games, and some pretty shocking luck on occasions. The need for improvement in the summer, in order to keep our year-on-year improvement in the league going, is certainly there. But we don’t need a radical overhaul. We ought once again to evolve, not revolve, as someone once said!